It has been almost three decades since Srila Prabhupada left the world. However, all devotees can still associate with him through his instructions. The legacy Srila Prabhupada left behind is appreciated by all devotees and academic scholars. His translations and commentaries on many scriptures and texts Vedic literature is itself a library. His works are used by schools and universities as textbooks, as they are the most authoritative and actual representations of the original scriptures. It is only right to explore this legacy through his books. 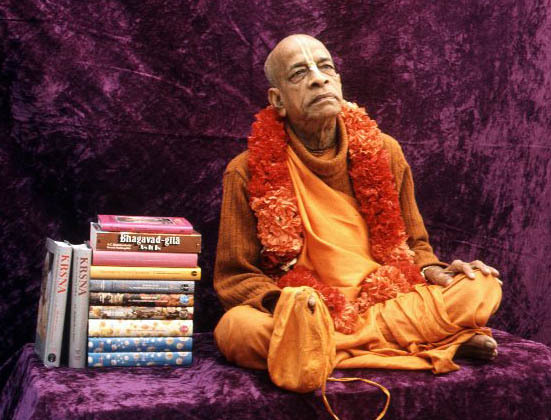 This gives a brief description of the most well-known books by Srila Prabhupada. Please click the RED link to read the book as they are. Please click the BLUE link to the description of the book. Back To Godhead (orig. 1944): As Srila Bhaktisiddhanta Sarasvati Thakura his spiritual master, instructed him to preach in English, Srila Prabhupada used this magazine as a start. This is the fortnightly magazine that Srila Prabhupada used to single-handedly write, print, and distribute to the public. As the movement grew, his disciples took over and wrote articles and columns regularly. Each Back To Godhead magazine contains the ‘founder’s lecture’ which has a transcript of a lecture by Srila Prabhupada. Bhagavad-Gita As It Is (1972): The Bhagavad Gita is read all over India and all over the world. However, was anyone able to understand it? What the real message is? Srila Prabhupada wrote his commentary in a very systematic manner, that followed through the rest of his books. He took the verse, broke it down with Sanskrit-to-English synonyms, and gave purports. He presented it without adding any interpretations, speculations, or any deviations. He presented what Krsna taught and the way Arjuna understood it. Caitanya Caritamrta (1975): Srila Prabhupada translated Caitanya Caritamrta, the entire life story of Sri Krsna Caitanya, the avatara of Sri Sri Radha Krsna in Kaliyuga. Gitar Gan: Srila Prabhupada poetically translated the entire Bhagavad-Gita into Bengali, so that it may be sung in kirtan styles common to Bengal. Since he emphasized on studying Vedic literatures through his books, he didn’t promote the Gitar Gan, which is why isn’t as common here. Srimad Bhagavatam (Cantos 1 – 10:13) (1977): The Bhagavata Purana or Srimad Bhagavatam is the tree of Vedic literatures. It is the confirmed to be the greatest Purana, or Vedic history. However, a translation of this voluminous work was not readily available. Srila Prabhupada took the actually scripture. In the same manner he translated the Gita, he translated the Bhagavatam as it is, verse by verse. He completed the translation up to the Thirteenth Chapter of the Tenth Canto. The Bhagavatam was completed by his disciples. Nectar of Devotion (1970): This is a summary of the Bhakti Rasamrta Sindhu by Rupa Goswami. Nectar of Instruction: This is a summary of the Upadesamrta by Rupa Goswami. Science of Self-Realization: This is considered to the best preaching tool amongst sankirtana devotees. It is a collection of interviews, conversations, and essays by Srila Prabhupada on various aspects, such as science, vegetarianism, reincarnation, and philosophy. Sri Isopanisad (1974): Of the one-hundred eight Upanisads (Vedic commentaries), Srila Prabhupada said that the Isopanisad (Isa Upanisad) is the one that will help one discover their real position and start building a relationship with the Supreme Absolute Truth, Sri Krsna. Teachings of Lord Caitanya (1968): While the Caitanya Caritamrta has the entire life story of Sri Caitanya Mahaprabhu, Srila Prabhupada took the teachings, the philosophy, and the doctrines presented by Sri Caitanya and His example and united those in this book.